From Bloomsbury Publishing: Rachel Ferguson was educated privately, before being sent to finishing school in Italy. She flaunted her traditional upbringing to become a vigorous campaigner for women's rights and member of the WSPU. In 1911, she became a student at the Academy of Dramatic Art. She enjoyed a brief though varied career on the stage, cut short by the First World War. After service in the Women's Volunteer Reserve, she began writing in earnest. Working as a journalist at the same time as writing fiction, she became "Columbine," the drama critic on the Sunday Chronicle. 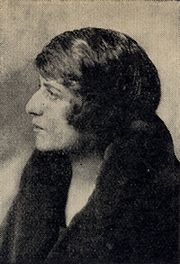 False Goddesses, her first novel, was published in 1923. A second novel The Bröntes Went to Woolworths, did not appear until 1931, but its wide acclaim confirmed Rachel Ferguson's position in the public eye. Over the next two decades she wrote extensively and published eight more novels. Rachel Ferguson's book The Brontes Went to Woolworths was available from LibraryThing Early Reviewers. Rachel Ferguson is currently considered a "single author." If one or more works are by a distinct, homonymous authors, go ahead and split the author. Rachel Ferguson is composed of 3 names. You can examine and separate out names.